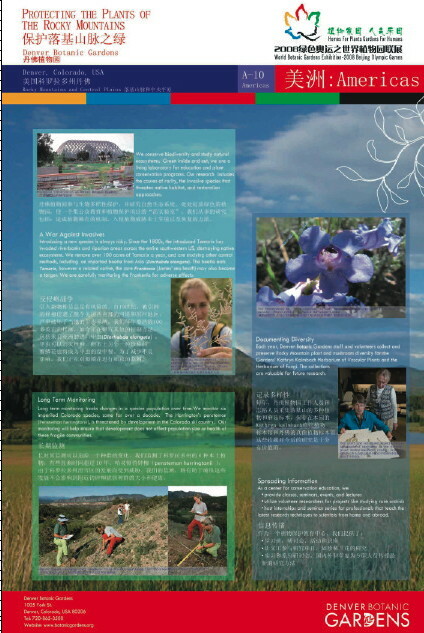 Denver Botanic Gardens is at the Beijing Olympics! No, not in pole-vault (with sunflowers) or fencing (with pruning shears) or swimming (among the lilies), but as a part of an international exhibit of botanic gardens called "Homes for plants, Gardens for humans" located at the Science & Technology Park at the Olympic Village, Beijing. This exhibit highlights what over 70 botanic gardens (including ours) are doing to conserve species and resources around the world. Each botanic garden is represented by a large color panel, describing their contributions. Kudos to the staff of the Research, Herbaria & Records Department at Denver Botanic Gardens for giving us so much to talk about on our panel for the exhibit! 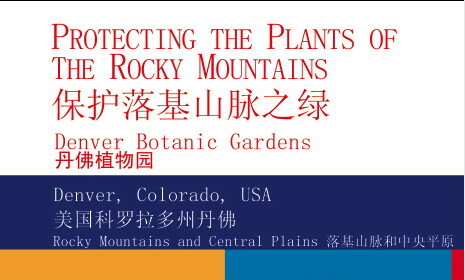 Check out the Science & Research navigation link to learn more about what we are doing to protect plants of the Rocky Mountain region. This blog post was written by Anna Sher, Ph.D., adjunct researcher and former director of the Research & Conservation Department at Denver Botanic Gardens.